A serial presentation of the Mughal effect on Vaisnava society. Having made a preliminary survey of the Mughal influence on Vaisnava art, we'll now start to explore the waves of destruction of India's temples by the Mughal invaders. In this three-part segment of the series, we'll begin by laying out a more complete picture of the broad historical timeline, starting with the glorious Appearance of Sri Caitanya Mahaprabhu. As is always the case, there are bound to be discrepancies in such long historical timelines. The dates will depend on the viewpoint of the historian and the documents they relied upon, with hopefully no confusion about the calendar system being used or errors made in calculations. The dates below are, as we understand it, the most widely accepted dates of these events. 1486 A.D. – Sri Caitanya appears in Navadvipa, Nadia, West Bengal, on the full moon night of February 18th, 1486. 1526 A.D. – Muslim conqueror Babur (b. 1483- d. 1530) defeats the Sultan of Delhi, becoming the 1st Mughal Emperor, ruling from 1526 to 1530. 1528 A.D. – Emperor Babur destroys the temple at Lord Rama's birthplace, Ayodhya, and erects a Muslim masjid in its place. 1530 A.D. – Humayun becomes the 2nd Mughal Emperor, ruling from 1530 to 1540, then being exiled to Afghanistan and Persia for 15 years, before return for one last year of rule. 1534 A.D. – The Departure of Lord Caitanya. 1555 A.D. – Humayun returns from exile, until his accidental death one year later. 1556 A.D. – Akbar (b. 1542 – d. 1605), the grandson of Babur and son of Humayun, becomes the 3rd Mughal Emperor at age 13, ruling from 1556 to 1605. 1565 A.D. – Muslim forces completely destroy the city of Vijayanagara. 1569 A.D. – Akbar captures the fortress of Ranthambor, ending the Rajput independence, and soon controlling most of Rajasthan. 1589 A.D. – Akbar rules the northern portion of India. 1605 A.D. – Jahangir takes over as 4th Mughal Emperor, ruling from 1605 to 1627. 1628 A.D. – Shah Jahan (b. 1592 – d. 1666) becomes the 5th Mughal Emperor, ruling from 1628 to 1658 A.D.
1630-32 A.D. – Two million Indians starve to death as Shah Jahan empties the royal treasury to buy jewels for his "Peacock Throne." 1646 A.D. – Shivaji (b. 1627 – d. 1680), general and founder of Maratha Empire (1674-1818), begins driving Muslims out of large areas, returning them to Hindu control. 1647 A.D. – Shah Jahan completes the Taj Mahal in Agra. 1658 A.D. – Aurangzeb (b. 1618 – d. 1707) becomes 6th Mughal Emperor. His demoniac policies toward Hindus, Marathas and the Deccan kingdoms contribute to the dissolution of the Mughal Empire, ruling from 1658 to 1707. 1675 A.D. – Aurangzeb executes Sikh Guru Tegh Bahadur, starting the Sikh-Muslim feud that continues to this day. 1679 A.D. – Aurangzeb levies Jizya tax on non-believers (Hindus). 1688 A.D. – Aurangzeb destroys the temples in Mathura, said to number 1,000. 1707 A.D. – At his death, the end of Aurangzeb's reign, which began the era known as the Later Mughal period. From 1707 to 1753 a great many lesser Mughal rulers to control, but were quickly trounced. 1755 A.D. – The British join the Peshwa to capture Gheriah and attack the Malabar Coast. 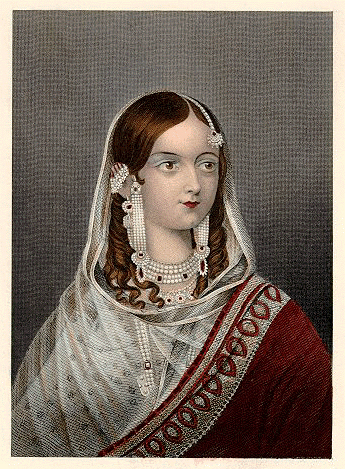 1800-1856 A.D. – By the early 1800's, the long decline of the Mughal Empire came to an end. With no real armies left to speak of, the Mughal presence was down to local palace courts. 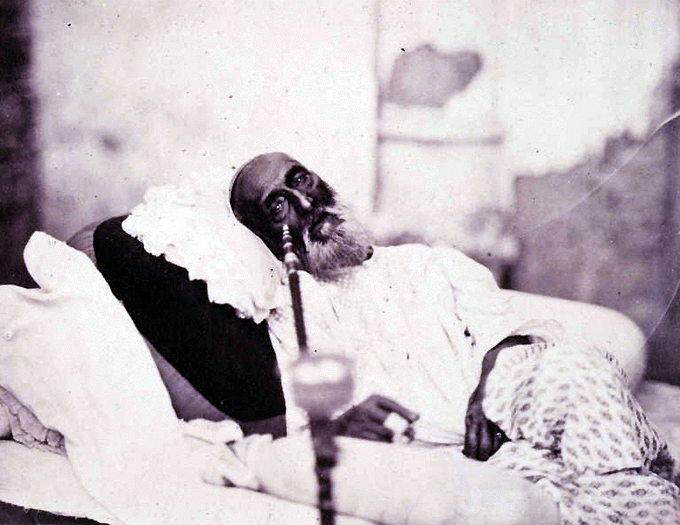 1857 A.D. – The Mughal throne was destroyed entirely when the British retook Delhi after the Rebellion of 1857, capturing Bahadur Shah, the last Mughal Emperor. Babur's arrival in 1526 to the death of Aurangzeb in 1707, a period of 132 years;the rule of Aurangzeb from 1658 to 1707 stands as a devastating 49-year period for Hindu India; andthe Later Mughal period, from 1707 to 1857, a period of 150 years during which the Mughal influence dwindled. During their reign, the Muslim rulers are thought to have destroyed some 60,000 Hindu temples throughout India, constructing mosques on 3,000 of these sites.